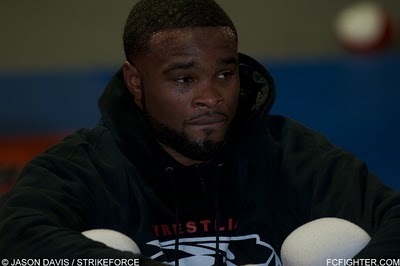 Tyron Woodley hasn’t been shy about the fact that he’s wants a shot at the Strikeforce welterweight championship, and after working his way to a unanimous decision win over veteran slugger Paul Daley on July 30th, the undefeated fighter is more certain than ever that he deserves it. Since Woodley signed with Strikeforce in 2009, the accomplished collegiate wrestler has scored victories over several established vets including Andre Galvao, the aforementioned Daley and Tarec Saffiedine, who is coming off a one sided decision win over Scott Smith. Saffiedine’s recent win drew praise from Strikeforce executive Scott Coker and others, leading some to conclude that the Team Quest fighter could be a front runner to face Woodley for the vacant welterweight belt. One would be hard pressed to argue with Woodley that considering his 9-0 record and six consecutive wins under the Strikeforce banner, that he has entrenched himself in the championship mix. Questions remain, however, as to who will face Woodley if indeed he’s awarded a title shot. Although since Zuffa acquired Strikeforce the company has insisted that it’s “business as usual” for the promotion, speculation has remained rampant as to whether it will eventually be merged into the larger UFC. The departure of former welterweight champion Nick Diaz and subsequent release of former heavyweight champ Alistair Overeem has only furthered the discussion. In other words, one has to wonder just how long the Strikeforce welterweight division is going to be around. Although it’s hard to say what would have happened if Diaz would not have left Strikeforce to fight UFC champion Georges St. Pierre, by surveying the promotion’s welterweight division as it stands now, a Woodley, Diaz bout would have been likely.